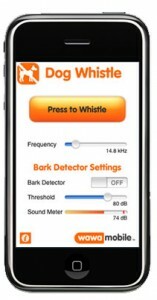 I was recently browsing the app store on my iPhone when I came across the dog whistle iPhone app from a company called Wawa Mobile that claims that by using ultrasonic frequencies on the iPhone, you can call your dog with it and it was only $0.99 to download it. The concept is similar to the ultrasonic ringtones in which dogs have much better hearing than humans, young or old. They have an even much wider range of hearing than those that are not affected by presbycusis do! It’s a single screen app that has all the options on it including a slider to adjust the frequency of the “Whistle” and a bark detector! If you enjoy playing around with mosquito ringtones and seeing who can hear what, it’s worth it to be able to change the frequencies quickly. It didn’t quite work for me with my dogs though, but I have’t had a lot of time to spend fine tunning the frequency yet. I did notice that when I played some of the frequencies that correspond to our free ringtones of the same frequency, my kids where unable to hear them as the normally do on my website. Either the frequencies are off or it’s getting changed/modified somehow. I hope to have time soon to fine tune it for my dog and see if it is a viable replacement for a dog whistle. you do realize that the iphone’s speaker can’t reach the frequencies required to provide the same effect as a dog whistle, right? Want a way to communicate completely without an adult even being CAPABLE of listening in? Do morse code using the mosquito ringtone. The code that adults CANNOT and ARE NOT ABLE to break.